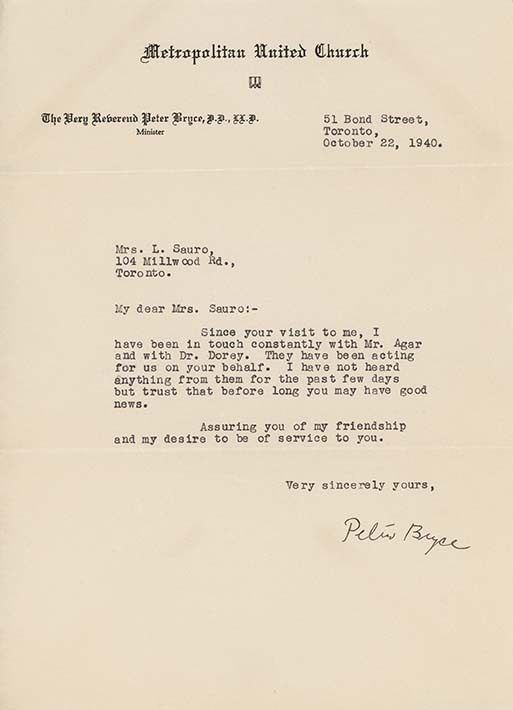 Letter from Peter Bryce, to Mrs. L. Sauro, October 22, 1940. It does seem that many member of the United Church also rallied to support Sauro. The author of this letter, Peter Bryce, would later provide a written testimony on Sauro's behalf (see ICEA2010.0008.0016), as would the others named, Mr. Agar and Dr. Dorey (see ICEA2010.0008.0018.a-b and ICEA2010.0008.0015).